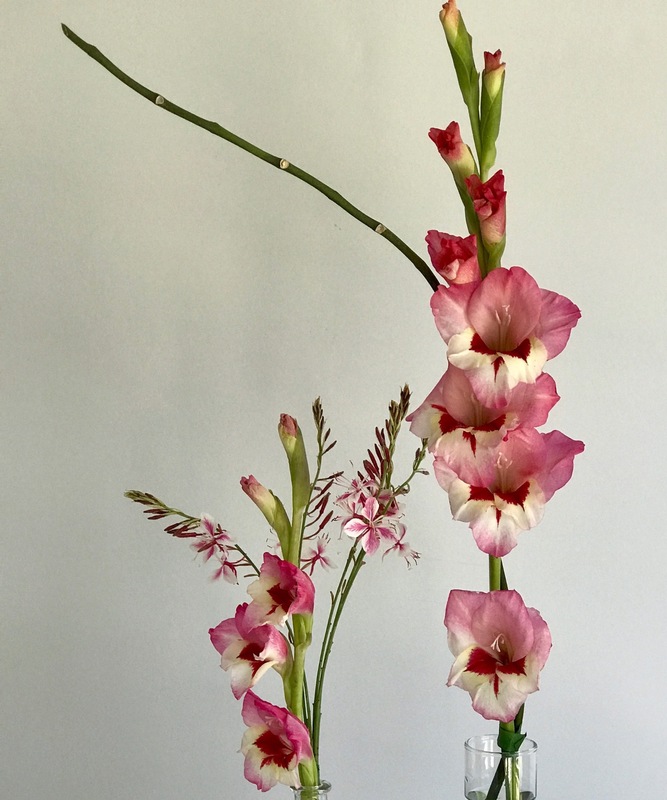 Gladiolas are an old-fashioned flower I adore, reminding me of many mornings spent with my maternal grandmother. She kept a kept a colorful vase of mixed gladioli on her indoor porch just off the kitchen, where we shelled butterbeans and peas and scraped, never peeled, the skins from tiny, new potatoes. Hope you enjoy the week ahead. This is the last week of my 200-hour yoga teacher training program. Soon Garden Bloggers’ Fling will begin. Looking forward to meeting some of you there. 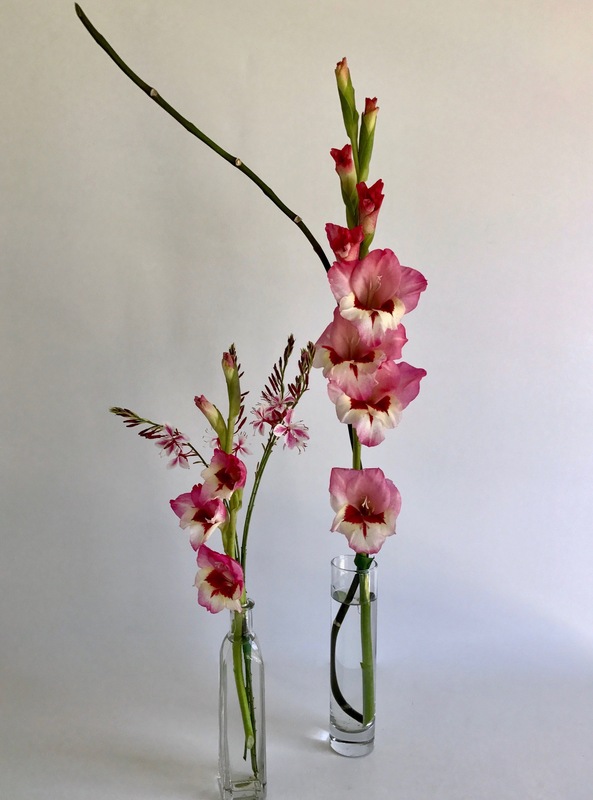 This entry was posted in garden and tagged 2017vase, flower arranging, flower design, Gaura lindheimeri 'Passionate Blush', gladiolus, in a vase on monday, nature photography on June 12, 2017 by pbmgarden. My grandmother’s room had a glider too! I like gladioli. These are a gorgeous color. It is nice to have flowers in the garden that evoke such fond memories. Lisa, I so agree. Gardens are full of nice memories like this. Beautiful! Have fun at the Blogger’s Fling, wish I could be there. Thanks Marian. I too wish you could be at Blogger’s Fling but I know you’ll be having a great time yourself. Take care. I love the way flowers bring back such memories. The love for your grandmother comes through. Thanks for the lovely comment Noelle. I was lucky to spend a lot of time with my grandmother. Such beautiful colors. Are they a smaller form? I don’t think I have ever seen those colors, but we don’t grow many here. The colors are strongly arranged aren’t they? It is not a smaller form, normal size. Oh, sometimes hard to tell from a photo. The colours go together beautifully. Lovely to grow plants that remind you of your grandmother. Thank you. It’s funny what memories stand out from childhood–these flowers definitely take me back. What a lovely pairing! I’ve not seen that Gaura before. The visual picture you’ve painted makes me want some fresh vegetables! Thank you. Hope you’re finding some garden veggies. I have one little green tomato. Mangoes and Papayas, veggie season is winter here. Thanks Eliza. The yoga training was fantastic–such a special time. Glad you like the glads. Those glads remind me of orchids – they’re gorgeous and the pink Gaura is a perfect accent. I’ve never tried growing glads here. They have a formal feel that I’m not sure fits my garden but I do admire their form so maybe I need to find a spot to give them a try. Hi Kris, the gladioli are definitely worth a try, formal or not. Mine tend to flop all around though as I never get around to staking them. Oh gorgeous. The gaura looks like a mini gladiolus. It’s a shame they are deemed old fashioned as there are some wonderful colours. I have yellow one so I must go and see how it is doing. Hope you found your yellow gladiolus in bloom Alison. I don’t mind if flowers are trendy or not. There is a beauty to single blooms is minimalist vases. And we love gladiolas in our area. We actually have Gladiola Days Festival in the next town over every year. Hi Angie, nice to meet another gladiola fan. I imagine the Gladiola Days Festival would be lovely. Happy memories of a childhood spent helping your grandmother brings back my own memories of shelling peas, slicing beans etc. I am always in awe of your (seemingly) simple arrangements. I need to see if my gladioli are flowering yet. Hi Christina, there were seemingly endless chores related to the vegetable garden but looking back I realize how lucky I was. An unusual but beautiful coloured ‘Glady’. Hi Brian, yes the patterning on that gladiolus is very different. Thanks Cathy. The glads have been nice this year and Gaura has surprised me with its vigor. I think it’s from all the rain. Unfortunately, now it’s getting plenty hot, and much less frequent rain–feeling like summer here.